My wife and I visited DM Weil’s gallery as part of our anniversary weekend away, somewhat randomly, looking for things to do in the Hudson River Valley area on TripAdvisor. While we enjoy the finer things in life, we’re not art snobs. Often, the art gallery experience is dull — sure, there’s some great art, or at least that’s what everyone calls it — but it’s totally different at DM Weil. Ken, the gallery manager, makes you really feel welcome and will gladly answer your questions about the art, the products available, and so on. Donna shared her story with us about her art, that gave us a real connection to her gift and talent on display. The art itself covers a broad range — busy, energetic, curious, transporting, nuanced, whimsy, vibrant. 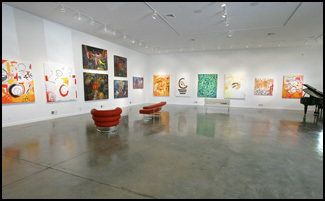 The gallery space is wonderful, airy, bright and crisp. It really gives you the opportunity to get lost in the art. In comparison to upscale New York City galleries, DM Weil’s gallery is beautiful, peaceful and relaxed. As guests, you feel so welcome and the hosts are generous, offering refreshments and conversation. We will certainly be back to see new works on display in the future. Even if you don’t think you care for art, if you’re in the area, and you can keep an open mind, definitely stop in when the gallery is open. Beyond the paints and canvas is a wonderful person who shares her time and talent with you, with everyone.